Read what happy customers have to say about their catering experience from Goodstuff Catering in Kelowna! Although we know we do a good job, receiving testimonials from our satisfied customers always makes us proud! Thanks so much for completing a perfect day. Our wedding reception was wonderful — the food, the service, the relaxed atmosphere. We've had great reviews from many friends and family. The menu was excellent — love the stuffed pork loin — and special attention paid to presentation and service.Your flexibility and patience was so appreciated during such a busy time and we were so lucky to be able to incorporate a little family tradition into our meal. Again, thank you for helping us create a wonderful memory. Just wanted to say 'thanks again' for the wonderful meal and great service at our reception. It was flawless, and we've had many compliments on the quality of the food. I will recommend Good Stuff to anyone I know who is having a gathering in the Okanagan area. Please send along my contact info if you ever need someone to give you a glowing reference! We have recently hired Ken and Rita from Good Stuff Catering for our wedding reception and would highly recommend them for any catering needs. The service was honest and exceptional. Rita met with us well in advance regarding the menu choices, pricing and other necessary arrangements, and great communication was carried out through the following months. The day of our venue they came with all the food hot and prepared and they were very accommodating to our guests, making sure everyone was full and satisfied and offering seconds as there was plenty of food available. They served parmesan chicken, beef, potatoes and veggies along with a variety of salads and pickles etc. 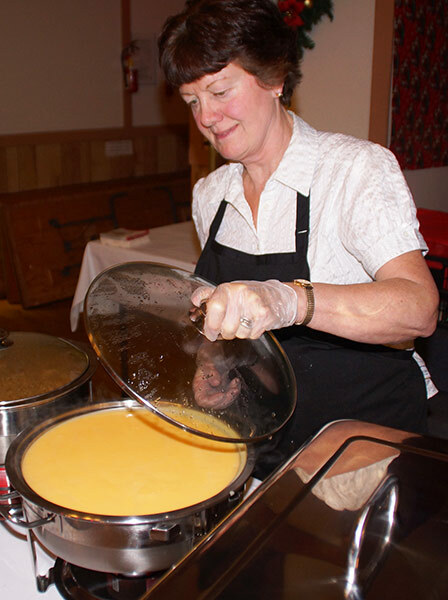 They also had several people helping serve and clear dishes which was great to help the flow of our event. We have high recommendations of Good Stuff Catering for a wonderful meal and professional service. © 2012-2019 Good Stuff Catering, Kelowna, British Columbia.